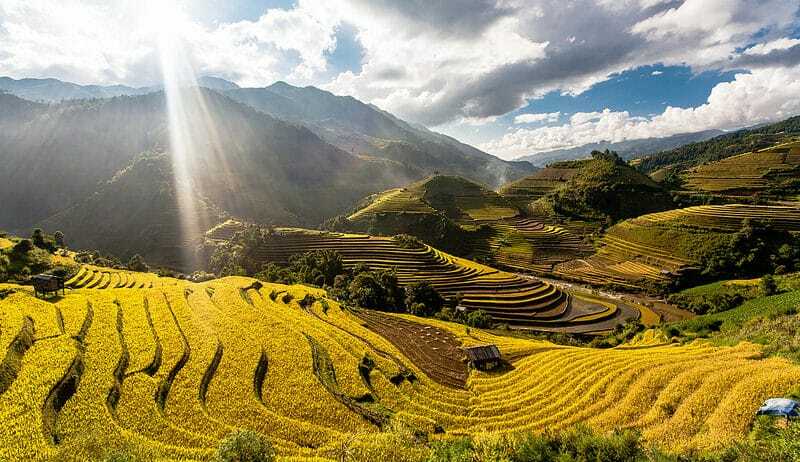 Located at Yen Bai province - the northwest region of Vietnam and about 280 km from Hanoi capital city, Mu Cang Chai is considered as one of the most picturesque landscapes of rice terraced fields for tourists to enjoy, discover hidden beauty of nature, immerse yourself in a rustic life of local farmers and other ethnic group of H'mong people in there. It is the best time for visitors to visit here in 2 main seasons. The first one from May to June when the local prepare to irrigate their farm to grow rice for a new crop. Normally, they will use bamboo pipes to move water from mountains to steps of the rice terraced fields. 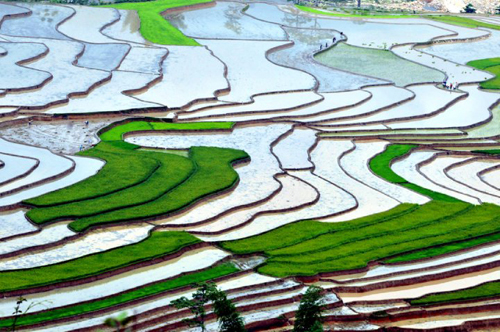 Then water spreads into the land and make the hard soil into softer and fertile for transplanting rice. The water on the surface reflecting images of blue sky, forest trees, birds and farmers can attract the interests of every photographer in here. Moreover, you can spend time in the mid - September to early November to come here when the whole rice paddy fields turns into the yellow colour looking like a golden silk stretching until the horizon far away. It seems to hope a good crop and prosperity for local farmers. You will definitely fall into the charming beauty of the rice terraced fields in a windy afternoon of a dazzling autumn season. It will be a perfect trip if you can walk into the wooden houses of the locals and taste their special dishes here. One of the highlighted food recommended to you is forest hog. H'mong people will not keep pig in cages or feed them, instead wild pigs are free outside of garden or forest. They mainly eat jungle vegetables, corn, potatoes, etc; therefore, the meat of forest hog smells good and delicious. 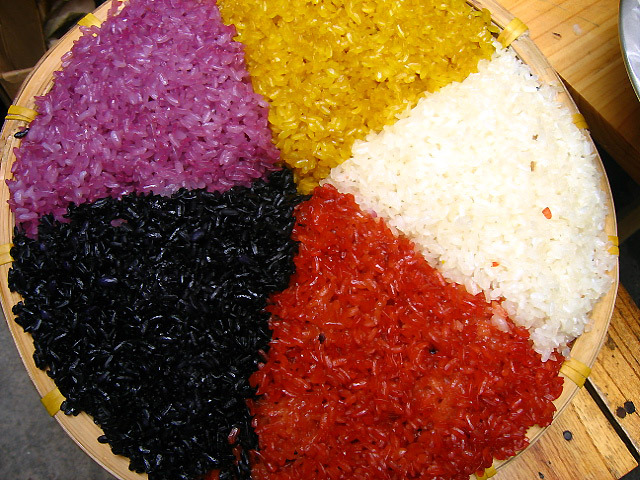 Five coloured glutinous rice is a good suggestion for visitors. This dish is commonly included in meals of Tet holiday or festivals of ethnic groups in the mountains. The locals use natural ingredients from leaves or roots of forest tree to soak the rice before cooking. 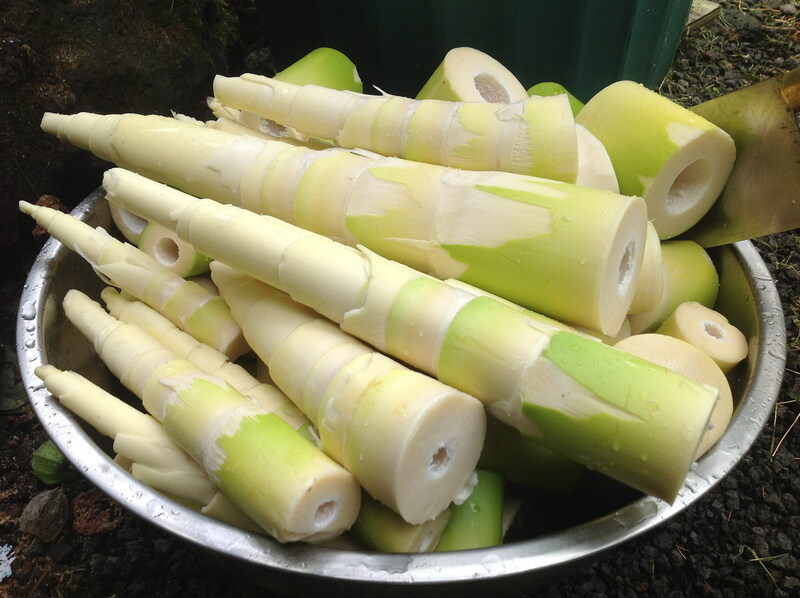 In addition, you can easily find bamboo shoots and other jungle vegetables in every meal of local people. Bamboo shoots are small, soft yellow and sweet in soup for right season.